Easysleep Waterbeds | "It’s more than good for your health. It’s a better nights sleep!" Easysleep Waterbeds – "It’s more than good for your health. It’s a better nights sleep!" 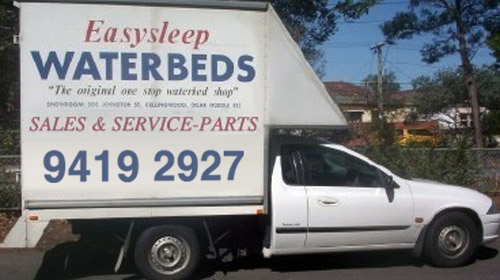 Easysleep is totally committed to all things waterbeds.We offer a complete ongoing after sales service. We stock the largest range of replacement parts, waveless mattresses, heaters and liners. Woollen Underlays for Soft sided and Hard Framed waterbeds. We stock Clipper matteresses and Blue Magic products. We still offer a range of quality made Waterbeds at discount prices. For over 30 years, our fully stocked Mobile service vehicles have serviced the greater Melbourne metropolitan area. We service as far away as Little River, Bacchus Marsh, Gisborne, Wallan, King Lake, Healsville, Pakenham, Tooradin and Portsea. On a waterbed, the shoulders and hips lie vertically and the spine is able to rest in a natural position.